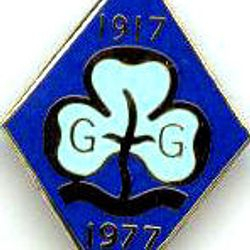 During the early years of Guiding, there does not seem to have been a custom of producing badges to mark special anniversaries. 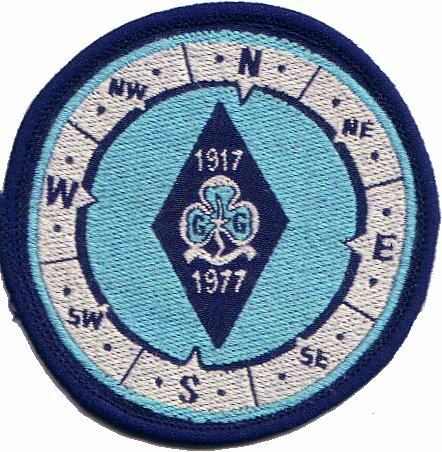 So although the 'coming of age' of Guiding was celebrated in 1932 (a year late, allegedly because of both the national financial situation and the work to fundraise for and build Commonwealth Headquarters), it appears there was no special badge produced to mark the occasion. 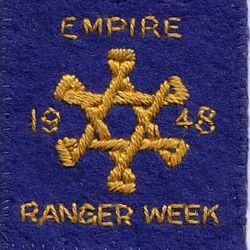 Empire Ranger Week was celebrated in 1948, which was cause for a special badge to be issued for all members in the various branches of the Ranger section, both in Britain and in various locations around the worl d, to celebrate amongst other things the 30th Anniversary of the Ranger section. 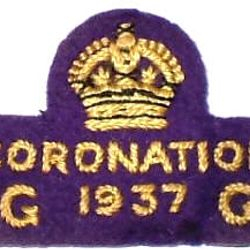 The next special anniversary badge was issued for another royal Coronation - that of Queen Elizabeth II, in 1953. The Queen had been a Guide in the specially-formed 1st Buckingham Palace Company, a Sea Ranger, and Chief Ranger of the Empire, which made it an extra-special event for Guiding, and celebrations of various kinds were held during the year in tribute. 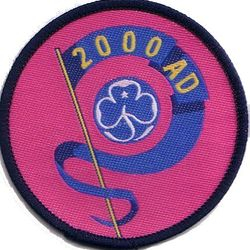 In 195 7 there were celebrations to commemorate the Centenary of the birth of Robert Baden-Powell, founder of Scouting. 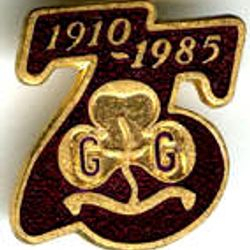 A special badge was issued in both ribbon and metal, in brass with scarlet enamel, a special Centenary Songbook was issued, along with a range of special souvenirs. 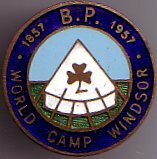 Special camps were also held around the UK. 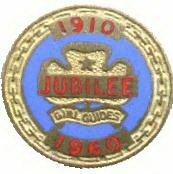 1960 brought the Jubilee, or 50th birthday, of Guiding, and the first Guiding 'birthday badge'. 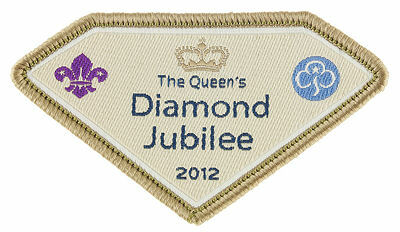 A special badge was issued in both metal and ribbon, a special jubilee song was written, and souvenirs were created too. A play was put on at the Empire Pool in Wembley with a pageant of Badges. 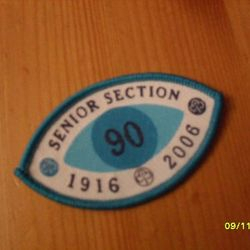 In 1966 the Cadet section celebrated their 50th birthday. 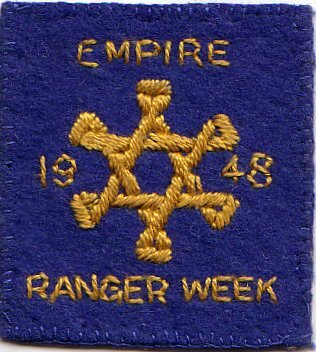 It seems to have been celebrated in a limited way, and to have been the only time that Cadets/Young Leaders had separate anniversary celebrations to those for Rangers. 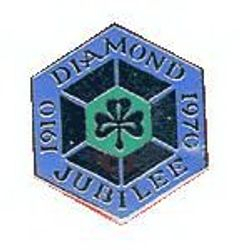 1970 was the Diamond Jubilee of Guiding, which again brought ribbon and cloth badges, together with a wide range of souvenirs. Special camps were held with cultural themes at locations around the UK, and a large rally was held at Wembley in London. 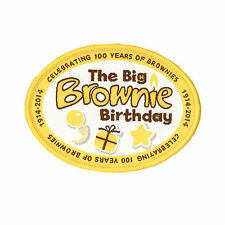 1974 saw Brownies celebrating their Diamond Jubilee with a special ribbon badge in two designs. Celebrations tended to be held at a local level with Brownie Revels and similar parties being held in each area. 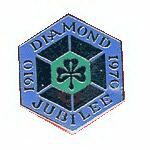 1977 saw Rangers celebrate their Diamond Jubilee with a special metal badge and also a woven patch - there doesn't seem to have been a ribbon badge produced. Gatherings were held around the country, and international camps held. Many units also took the opportunity to undertake some international travel of their own, with visits to many places across Europe. 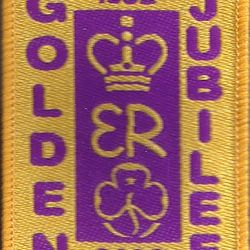 1977 also brought the Queen's Silver Jubilee, with a special joint badge in both metal and woven patch form, for Guides and Scouts - it appears that this was the first time both organisations have used the same badge to mark a special occasion - something which was next repeated in 2012 with the Queen's Diamond Jubilee. 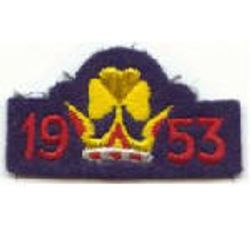 The national in general celebrated the jubilee with street parties, and many in Guiding were involved in local initiatives such as planting Silver Birch trees and installing park benches in their area. 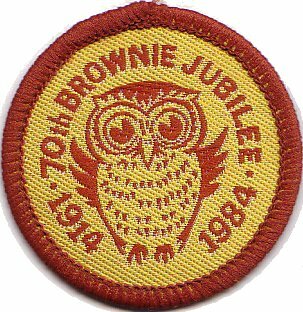 1984 was the Brownie Jubilee, with a cloth patch issued. It was marked with a national tea-making competition which saw Brownies challenged to make tea in as unusual a place as possible. Locations included football stadiums, under trees, on airport fire engines and in the middle of the Forth Bridge! 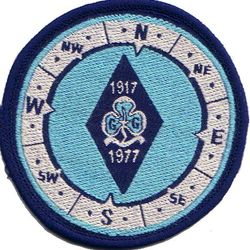 19 85 was Guiding's 75th anniversary, with a special m etal badge and cloth patch. 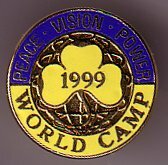 A special flame was lit in London and shared around the UK and beyond, being transported by various means, and special 'Rainbow Camp' international camps were held simultaneously in counties across the UK. 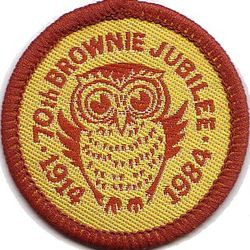 1989 saw celebration of the Brownies' 75th birthday, with a cloth patch, local Brownie Revels and celebrations were held around the UK. 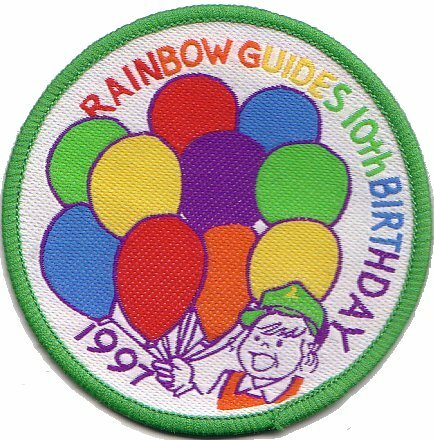 1997 was the 10th Birthday of Rainbows, marked with a cloth patch. 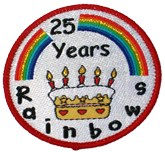 Their first turn at having an anniversary celebration saw 'Rainbow Riots' being held across the UK, with lots of local gatherings for parties, games, and of course brightly coloured birthday cakes! 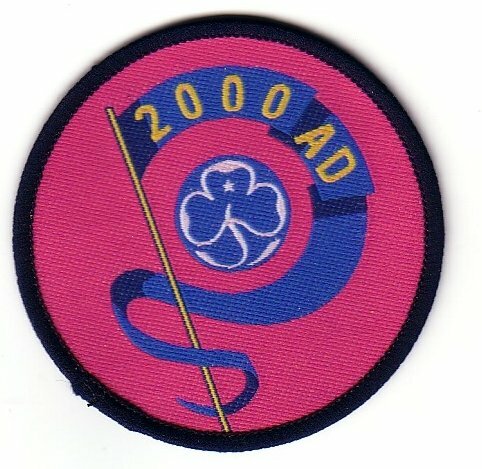 2000 aka the millennium, was marked with a special metal badge and cloth patch - the o nly ones for an occasion which was neither a Guiding anniversary nor a Royal occasion. New Zealand took the honour of being the first to celebrate Thinking Day in the 2000s. 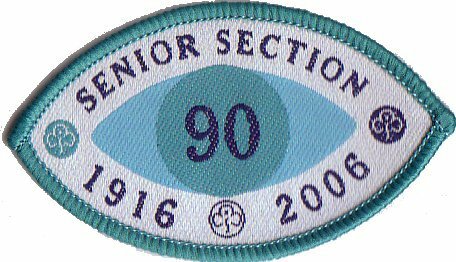 Although it would also have counted as the 90th anniversary of the Guide section, it was decided not to mark this specially - which didn't stop many Guide units from having their own local celebrations anyway! 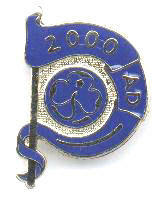 2002 brought the Queen's Golden Jubilee, with a cloth patch and metal badge. 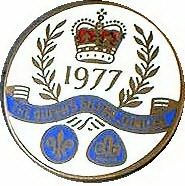 As had happened back in 1977, celebrations were not confined to Guiding, but many Guiding members were involved in the local and national celebrations, including street parties and special concerts. Some members were also involved in special 'tribute' challenges to mark the links between Guiding and Royalty. 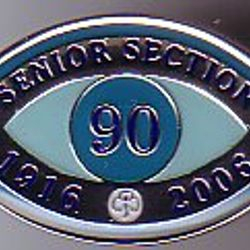 2006 was marked as the Senior Section 90th Anniversary. 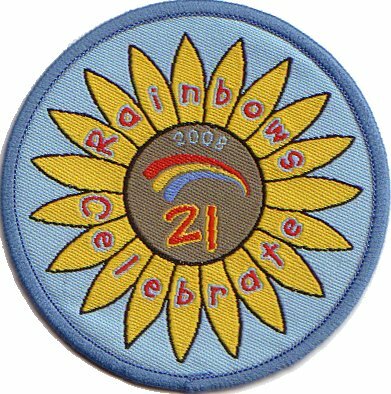 2008 was the Rainbow 21st Birthday, marked with sunflower activities and a specially created Rainbow Roundabout pack which contained lots of birthday activities. 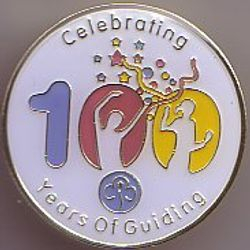 2010 brought round the Guide Centenary, with metal and cloth patches. The actual celebration year started in September 2009, and ran until 20th October 2010 (at 2010 hrs). 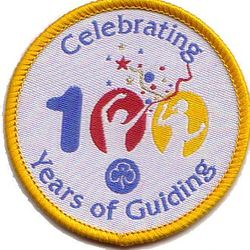 Although technically only the Guide section was due to celebrate, it was decided that all sections should be involved with Princess Parties for Rainbows, Brownies taking over buildings of all sorts and Senior Section having Getaways. 201 2 brought two anniversaries in one year! 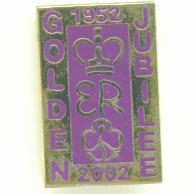 First up was the Queen's Diamond Jubilee which was marked with special badges - and for the first time since 1977, the Jubilee badges for both Guides and Sc outs were of the same design. 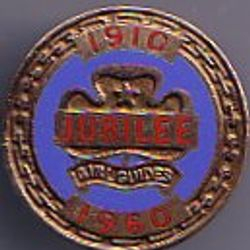 As on previous occasions, the Jubilee was celebrated nationally with street parties and special concerts. 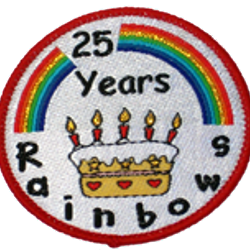 The other big celebration was the Rainbow 25 Anniversary, with a special badge which was designed by a Rainbow. Special 'Rainbow Riots' were held around the country to mark the special birthday. 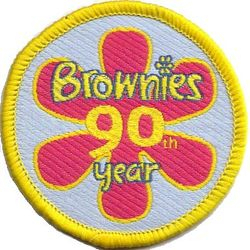 But we weren't done with celebrating yet, for the next big celebration year was soon upon us in 2014, when Brownies had their turn at being 100 years old, and celebrated by holding lots of 'Big Brownie Birthday' events. 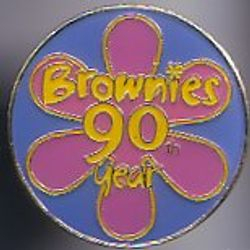 There were 'Star Quests' and special stay-aways (including abroad), and miniature replicas of the original Brownie Promise Badge were issued (fortunately, substantially smaller than the real thing, which will hopefully help to avoid confusion). Next in 2015 came another royal anniversary, for it was in that year that Queen Elizabeth II became the longest-reigning British monarch. 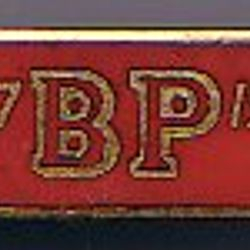 In order to mark such a special occasion, a badge was issued, in both cloth and metal forms, for all who were Guiding members on that date to wear. 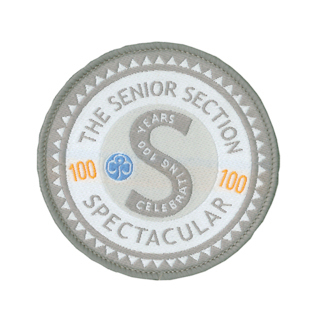 2016 brought the Senior Section's turn to celebrate, being 100 years since their oldest section, the Cadets (now Young Leaders) were formed - and they marked the year with the Senior Section Spectacular, a whole range of events and activities to mark 100 years of Senior Section - Cadets, Senior Guides, Rangers, Land Rangers, Sea Rangers, Air Rangers and Young Leaders, and of course now incorporating Leaders, Commissioners, Advisers, Trefoil Guild and all other categories of member within the 14-26 age group. 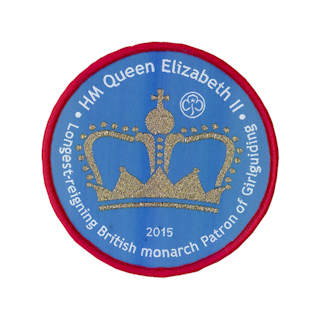 2016 also brought a special badge to mark the Queen's 90th Birthday, with street parties and tea parties being held in a range of locations, and a series of beacons being lit - with Guiding members involved in some of these celebrations. Many units also took the opportunity to send birthday cards to the Queen, and were delighted to receive a letter and card in return. 2017 has brought two more anniversaries. Firstly the Rainbow 30th Birthday. 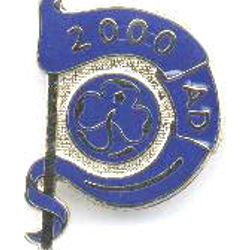 No nationwide badge was produced for this, although many of the Countries and Regions had local badges, challenge badge packs and celebrations. 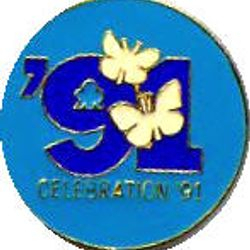 But there was also another royal anniversary, with the Sapphire anniversary of Elizabeth II becoming monarch, and a special badge was produced. 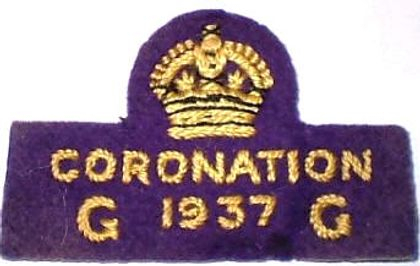 And in 2018 it was the 65th anniversary of the coronation, also with a badge. 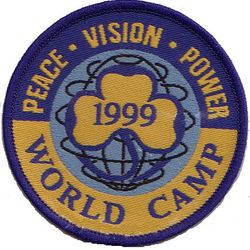 There have also been 3 'World Camps' - in 1924 at Foxlease (to mark the first World Conference being held at Foxlease), 1957 at Windsor Great Park (to mark the centenary of Robert Baden-Powell's birth) and 1999 at Foxlease. 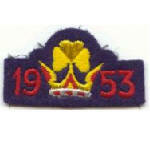 The latter two had special badges, as shown - did the first one?